What do natural reserves, botanical and zoological parks, anthropology museums and department of linguistics have in common? They all describe their objects as endangered beings. The series of essays collected by Fernando Vidal and Nélia Dias start from this diagnosis. If there is a contemporary “endangerment sensibility” in global communities of experts, what is its history, and what kinds of assemblages does it produce? Raising such historical questions involves stepping back from the catastrophic discourse on species extinction and the sense of crisis that often accompanies environmental humanities. When so many different objects are described and conceived as endangered, what does it tell about our contemporary ontologies? First and foremost, it means that the classical distinction between a stabilized nature and a realm of culture opened to human initiative is obsolete. At the age of the ‘anthropocene’ (beautifully evoked by Julia Adeney Thomas in her coda to Vidal’s and Dias’s volume entitled “Who is the ‘We’ Endangered by Climate Change?”), when the human species appears as a geological force able to transform its environment permanently, all the beings we live with appear as more or less endangered. The two terms that constitute the title of this book—biodiversity and culture—do not rely, therefore, on the classical distinction between nature and culture. On the contrary, the editors rely on Philippe Descola’s argument that the problem of biodiversity forces us to think “beyond nature and culture”, since natural diversity is as endangered as cultural diversity. The problem is rather to think about the different ways to represent diversity, thus raising the question: how does the loss of diversity appear as a danger today? The museum is probably the paradigmatic form of listing, through the practice of the inventory for national heritage. Following that model, nature itself was conceived as a museum whose diversity should be listed and preserved—in short, as a botanical and zoological garden for human contemplation. About natural species, David Sepkoski writes: “Under the endangerment sensibility, the threat to be protected against is extinction, and what is to be preserved is not any single entity but rather diversity itself.” (62) The discourse on extinction is at least two centuries old, but Sepkoski notes that it has shifted from the scientific representation of a slow, gradual and inevitable competition between individuals to an ecological warning on the sudden and catastrophic disappearance of whole species. But such a position raises questions on which species, language, society or heritage site should be preserved locally, and how many of them would constitute “diversity.” As Etienne Benson notes, “the endangerment sensibility facilitates certain kinds of relationships and hinders others.” (176) Thus, Stefanie Gänger shows that the memorialization of the “dying gasp” of Pascual Cona, presented in 1927 as one of the last Araucanians, was a way for the Chilean government, through “salvage anthropology”, to silence the land claims of their descendants, now called Mapuche. One of the main results of this collective investigation is to draw attention to the analogies between the museum, the lab and the natural reserve, considered as vulnerable machineries to preserve endangered beings. They are repositories where objects are stored away from risks of destruction or extinction, and that must be constantly maintained. Rebecca Lemov thus shows that Claude Lévi-Strauss conceived the Laboratoire d’anthropologie sociale of the Collège de France on the model of departments of cultural anthropology he had visited in the US, as a space where computers would help humans preserve massive stockpiles of data, under the conviction, often expressed with romantic tropes of lament, that after “savage” societies had disappeared, the files written about them were themselves vulnerable. Lemov thus speaks of a “second-order endangerment” as “a particular way of arranging objects and ordering systems.” (89) Lemov shows the influence on Lévi-Strauss of a project of microcard database led by Bert Kaplan in the US, whose ambition was “to revolutionize the storage of social scientific data sets that were effectively like the California Condor or the Roseate Spoonbill, facing extinction from forces of neglect or active harm (such as floods, fire and poor storage conditions. )” (97) Lemov thus asks important questions on the techniques through which the life of societies is transformed into “stocks of knowledge” that can be stored, circulated and used for academic purposes—a question that is still relevant when physical microcards have been replaced by huge databanks on websites. Endangerment, through the various forms it has produced in global landscapes, thus appears as more than a diffuse sensibility providing intrinsic value to threatened beings. It is a stage in a rational process of valuation of life, a mode of accumulation of the past and investment in the future that mobilizes affects and concepts in a productive way. Frédéric Keck is a researcher at the Laboratoire d’anthropologie sociale and the head of the research department of the musée du quai Branly. He has published works on the history of social anthropology and on contemporary biosecurity practices. Keck F. Fernando Vidal’s and Nélia Dias’s Endangerment, Biodiversity and Culture. Somatosphere. 2016. Available at: http://somatosphere.net/2016/fernando-vidals-and-nelia-diass-endangerment-biodiversity-and-culture.html/. Accessed April 24, 2019. Keck, Frédéric. 2016. 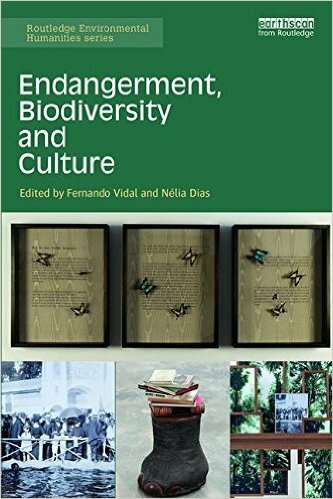 Fernando Vidal’s and Nélia Dias’s Endangerment, Biodiversity and Culture. Somatosphere. http://somatosphere.net/2016/fernando-vidals-and-nelia-diass-endangerment-biodiversity-and-culture.html/ (accessed April 24, 2019).